If your wanting to test your knowledge of favourite television soaps and train your brain, then InsideSoap Puzzles will have you entertained for hours. You’ll also get the inside scoop from several of the actors who play some of the most beloved characters on British television. Buy a single copy or subscription to InsideSoap puzzles Magazine. 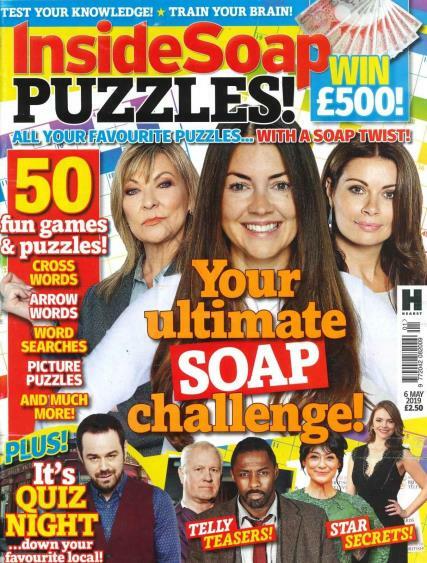 Each issue brings you brand new puzzles all related to the soaps you love. As well as interviews and features with some of the biggest soap stars in the industry. You’ll get access to content not available anywhere else. Why not challenge yourself and try to complete the ultimate soap challenge. If you manage to do so, you’ll be in for a chance of winning £500. In order to do so you’re going to have an extensive knowledge of many soaps. As you’ll need the answers from several pages.